All of 2018, the only Porsche we kept talking about was the Cayenne - not only because it was the one and only major launch from the carmaker, but also because it left us mighty impressed with its unreal dynamics. The Cayenne is proof that Porsche is just as meticulous about the dynamics of its SUVs as it is about the performance of its sports cars. But to understand just how important SUVs are for Porsche right now, you have to glance at the sales figures of not the Cayenne, but its smaller sibling - Macan. Last year, the Macan outsold the 911, Boxster and Cayman, combined! In India, however, you have a better chance of spotting the rare 911 GT3 on the road, over a Macan. Doesn't quite add up? Blame it on the skewed positioning of this highly capable compact SUV. At prices touching over a crore, the Macan was positioned way too close to the Cayenne to make any logical sense. But this year onwards, Porsche India will work out a better price and positioning for the car and the timing couldn't have been better to do that - for the Macan is now updated and the new one promises to be even better. It is a midlife makeover and not an all-new car, but the design has been updated to fall in line with all of the new-generation Porsches. So you get a seamless strip of lighting on the tailgate and that's the easiest way of identifying the new Macan from the older one. 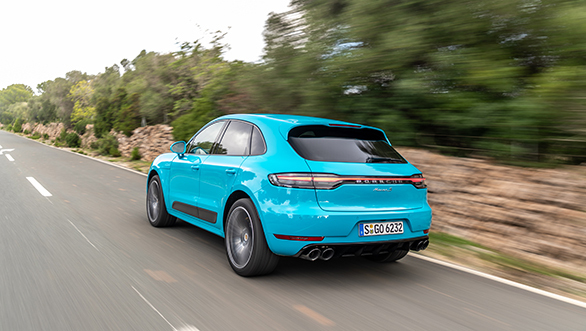 The Macan was one of the first Porsches to feature the new three-dimensional sculpting on the tail lights and the new one looks all the better with the seamless design. Furthermore, it also highlights the width of the car and makes it appear larger than the outgoing model. The headlights have been given a mild revision too and come with LED headlamps as standard. The grille and bumpers have been revised for larger air ducts. Porsche has also added new design options for the 20 and 21 inch wheels and I like the new five-spoke option in particular. These wheels can be had in a variety of colour options. Similarly, the blades on the doors can be customised in a matte, gloss, grey, body colour or carbon finish to suit your taste. The overall treatment of the facelift may not look like much, but the updates certainly make it appear more up to date on the showroom floor, as well as on the road. The cabin has bigger changes in comparison. The new touchscreen infotainment will instantly draw your attention. It runs the same software as the new Cayenne but features a 10.9-inch screen which is smaller than the Cayenne's 12.3-inch unit, but larger than what the rest of the competition offers. We love it for its high-resolution graphics and ease of use, which only makes the user experience richer. There are still a plethora of switches still on the centre console, though. 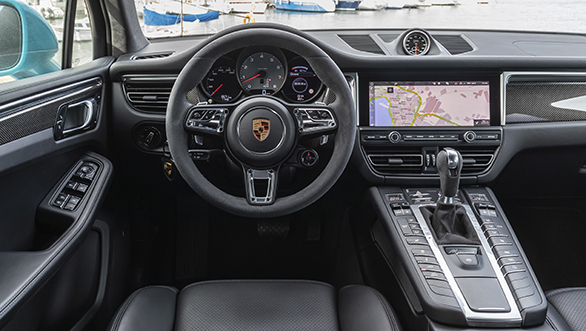 The older peripheral-electronics architecture on the Macan compared to the new Cayenne, restricted the number of touchscreens/screens Porsche could integrate into the cabin of the new Macan. Even instrumentation too, has one digital pot in line with two analogue units for the speedo and tacho respectively, to complete the classic Porsche look. A panoramic sunroof is also standard now. The other big highlight of the new Macan that most driving enthusiasts like you and me will appreciate is the optional GT steering wheel. It comes in straight from the new 911! It is designed to make your hands fall naturally in a sporty 9:3 position. It also features the new steering mounted driving mode selector on the wheel itself to cycle between Normal, Sport, Sport+ and Individual modes. 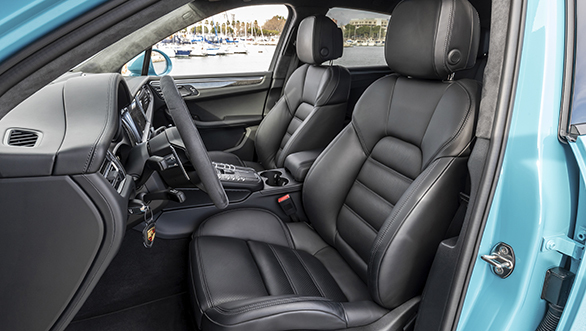 Like the exterior, the cabin trim too gets new colour options and material choices and as you would expect, there is meticulous attention to detail. After all, it is made by the same carmaker that took a year and a half to fine-tune even its printed brochure for the Macan, to ensure that the photos and layouts made it nothing short of being a collector's item! 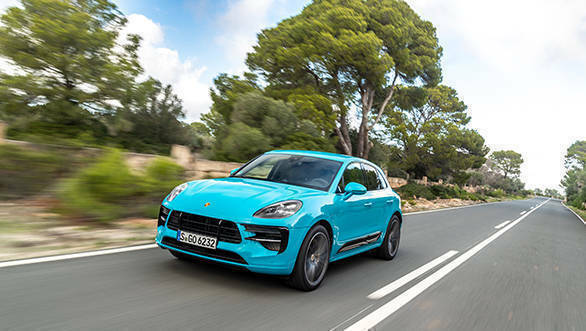 At the moment, the Macan is only available in a base and the S variants - but it is a no-brainer that a GTS and turbo variants are on their way too. 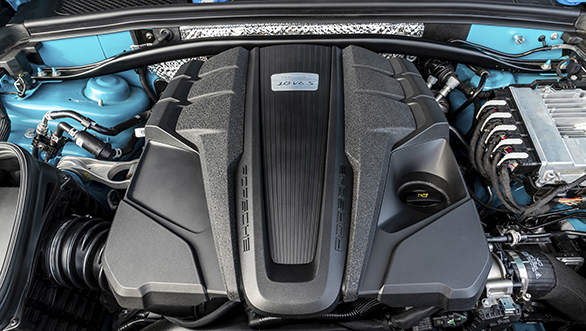 While the base is, of course, the volume generator, the Macan S is the one that has our attention at the moment. 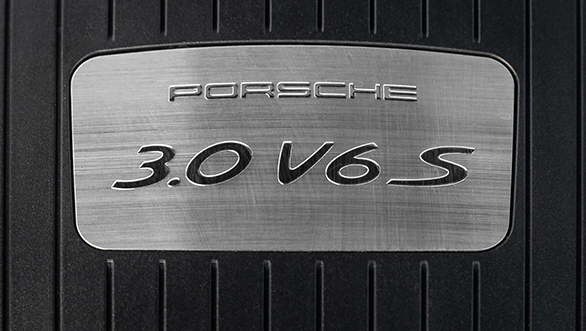 It features the new 3.0 V6 petrol engine from the Cayenne and compared to the outgoing 340PS/460Nm 3.0l V6, this one puts out 354PS and 480Nm. While the top speed of 254kmph remains unchanged, the new Macan S accelerates quicker with a 0-100kmph sprint time of 5.1s compared to the previous model's 5.2s run. The faster acceleration is also courtesy the turbocharger placement, which is now inside the vee of the cylinder banks, which accelerates the turbocharging process. Apart from the faster sprint, it also aids with better low-end performance and faster acceleration out of corners. The change isn't noticeable in day-to-day driving, as the Macan was always a quick car. But should you take to the racetrack, the benefits should be seen on the timing sheets. The new V6 also sounds a tad bit better than the one in the outgoing car. At cruising speeds or low engine speeds, there are mild yet noticeable vibrations in the pedals and there is a bit of humming sound, which can get annoying. This phenomenon is more evident in the Comfort mode as it tends to move to high gears quickly to better fuel economy. But under acceleration or once you move past the 2,000rpm mark, the engine smoothens out. The best way to enjoy the Macan, is in the Sport mode, where the throttle response is significantly sharper, and the humming noise from the V6 into a throaty growl is quite enjoyable! Our car didn't come with the GT wheel, or the Sport Chrono package, so we didn't get a chance to try to boost mode (yes, the Macan gets it too!). Even otherwise, the acceleration is quick at city and highway speeds and quite linear at that. We didn't get a chance to drive the base Macan. It uses a 2.0-litre four-cylinder engine with a respectable 252PS and 370Nm output, which is good for a naught to 100kmph time of 6.7s. 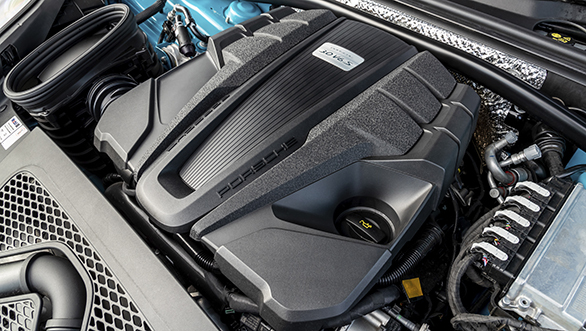 Good news is, that while these two engines are detuned for Europe given the requirement of a petrol particulate filter to comply with new emission norms, the Macan that will come to India will have its engines running at full steam. Porsche has made quite a few tweaks to the front end of the chassis. The rim sizes range from 18 to 21 inch, but the width of the 19 and 21 inch rims has been reduced by half an inch - and that gives them the opportunity to have different sizes for the front and rear. They have also replaced steel with aluminium in the front forks that connect the springs and dampers to the axle and that has made the setup lighter. The result is that turn-ins are sharper than ever even for the base setup. The Macan is just as agile as ever and easily the best driver's car in the segment. The ride has a firm edge to it, but in typical Porsche fashion, there is suppleness to it, and that is a hard find in most luxury SUVs with a sporty intent. 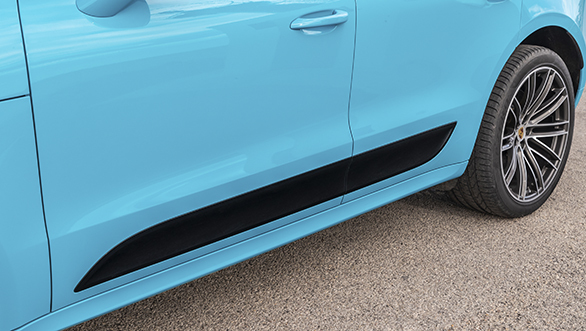 The Macan can also be specified with adaptive air springs that can provide an even cushier ride and allow changes in the ride height if the going gets rough. In fact, the Macan is quite capable off the road too and though we didn't get a chance to take the new one to any tricky terrain, we expect it to be just as good as the old one, if not better. The Macan S can also be optioned with Ceramic Coated Brakes (PCCB) and these are highlighted by the golden callipers that are seen here. By 2020, the more enduring Surface Coated Brakes (PSCB) like the Cayenne will also be available on the Macan. The new Macan goes up against the likes of the Jaguar F-Pace and BMW X4, that we absolutely loved. The big difference though is, this time around Porsche promises to price the Macan very competitively against these cars and also make it a viable option for anyone looking at cars like the Q5 and the GLE. 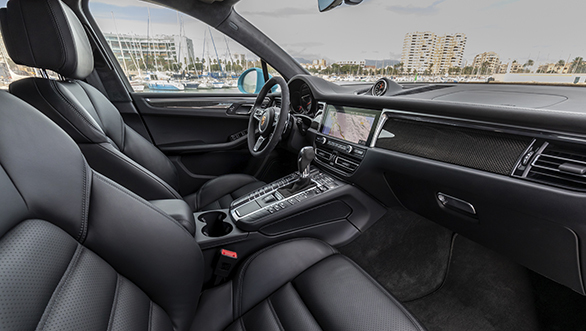 Though not as spacious, the Macan could actually make a lot of sense for those who spend more time behind the wheel than in the rear seat, and with its new range of equipment on board, it could very well be one of the most value for money driver's cars in the segment!